INTRODUCTION: As morbid obesity becomes an increasingly frequent medical problem, novel surgical treatments to induce weight loss are being developed. The laparoscopic adjustable gastric band (LAGB), well proven to be a safe and effective means of weight loss, is such an example. Many of the complications related to the LAGB involve an excessive amount of stomach cephalad to the band. Multiple terms have been used to describe this situation, including dilation, prolapse, slip, and slippage. Unfortunately, the nomenclature of the differing clinical scenarios that result in excessive stomach cephalad to the LAGB is often used interchangeably in error. It is difficult to accurately interpret complications and impossible to draw conclusions about treatment strategies when the etiology, name, and description of the differing situations are used randomly. In fact, there are different clinical and technical reasons responsible for each specific clinical scenario. METHODS: We analyzed the literature and compared it with our clinical experience. In doing so we identified five distinct situations where too much stomach occurs cephalad to the band. The reasons for each specific complication, as well as causes and treatments are outlined. The complications are classified as types I through V: anterior gastric prolapse, posterior gastric prolapse, concentric dilation of the gastric pouch and/or esophagaus, immediate postoperative pouch dilation, and ischemia/necrosis of the fundus. Types I, II, and IV are due to technical complications at surgery: failed placement of plication sutures, entry into the lesser sac, and placement of the LAGB too low on the stomach, respectively. However, type III is due to overaggressive band adjustments. Finally, type V, necrosis, is a potentially life-threatening complication that can be associated with any of the type I-IV scenarios. 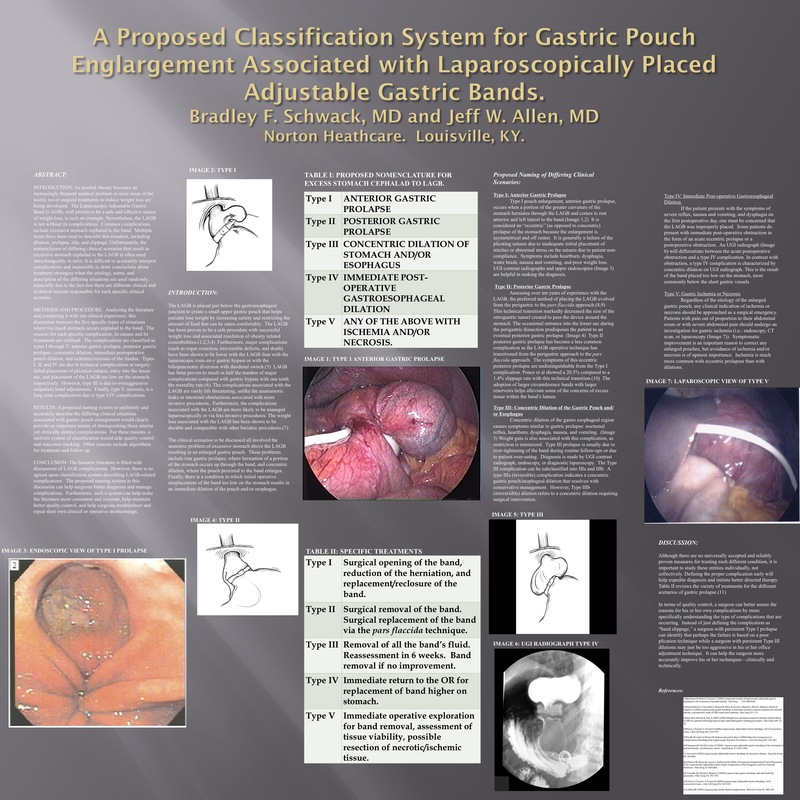 RESULTS: A proposed naming system to uniformly and accurately describe the differing clinical situations associated with gastric pouch enlargement provides an important means of distinguishing these similar yet clinically distinct complications. In addition to guiding the surgeon’s treatment plan; reasons for such a uniform system of classification include quality control and outcomes tracking.